It’s Christmas time again and it’s time to share some of the items that are on my personal wish list – along with gifts that any drummer would be happy to receive! A NEW DRUM SET! $150-$5000. This is the perfect gift for anyone who either wants to learn how to play the drums, or wants to upgrade their current set. Sabian AAXplosion Cymbals Set. $700. The next best present besides a brand new drum set would be brand new cymbals! 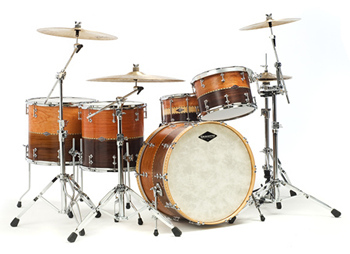 Drummers always need better cymbals, and your drummer is will love these. DW 9000 Series Hardware Pack. $150-$1039. If your drummer was anything like me growing up, he has been buying cheap drum hardware from Craigslist. This year you can make his dream come true by replacing all, or some of his hardware for his drum set. I own these stands and have posted a review of them HERE. Ahead Armor Ogio Engineered Hardware Sled with Wheels 38x16x14 . $200-$300. If your drummer is a giggin’ drummer, then he or she will most definitely need a hardware case or bag for taking their hardware to gigs. I have this particular hardware case and have reviewed it HERE, but I also highly recommend SKB cases. Kickport Bass Drum Enhancer . $40. I didn’t know what to think about the Kickport when it first came on the market, but after my friends and sound engineers affirming the sound it was giving me, I became a believer. See my review HERE. Drumming T-Shirt Weapons Of Mass Percussion Drums . $20. …Because every drummer needs that one cheesy drummer t-shirt. TAMA Rhythm Watch 2 . $100. Every drummer should be able to play with a click track, even if you don’t see yourself using a click track in the future, it’s nice to at least have that skill in your bag of tricks. Roland SPD-SX Sampling Pad . $799. OR Roland OCTAPAD SPD-30 Digital Percussion Pad $699. For the drummer who wants to integrate some additional sounds into his set up without have to lug around 500 percussion instruments! Benny Greb The Language of Drumming . $25. Winner of the 2013 Modern Drummer Reader’s Poll for best Clinician/Educator and Educational Book, Benny’s book will transform your drumming. Mike Michalkow’s Drumming System. $127. This is one of the best drum lessons DVD packages that I’ve ever owned. Check out my review HERE.